E S S A Y Who knew? Millennials are enduring a housing crisis and baby boomers may hold the key…literally. As in the house key. High rents and home prices are locking millennials out of affordable housing options. At the same time, boomers are sitting in houses with a lot of empty bedrooms. Real estate site Trulia is calling this a match made in housing market heaven. And they are calling these potential matches boom-mates. By extrapolating from census data, Trulia estimates that there are around 3.6 million vacant bedrooms in the 100 largest U.S. metropolitan areas. Boomers want to remain in their homes and millennial renters are desperate for cheap rents. If this sounds to you like the perfect scenario for a sit-com, I’m way ahead of you. 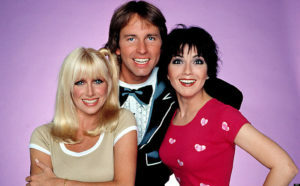 The first pitch that comes to mind is a remake of Three’s Company. But instead of two girls and guy, the cast is made up of two boomers and a girl. The husband and wife boomers spend all their time reminiscing about Woodstock and looking up slang in the Urban Dictionary while the millennial is always walking around with earbuds and looking for the next big app. If that doesn’t work for you, there’s Happy Days. Howard and Marion Cunningham, you may recall, did rent an upstairs room to The Fonz, so we’re not talking about a big leap here. In this remake, their millennial boarders do not have names like Fonzie or Chachi but the show would feature their struggle for respect in a world that constantly tries to diminish their ethos. The Fresh Prince of Bel-Air? Street smart millennial from Philly moves in with wealthy boomers in LA where his sense of entitlement is a constant source of friction with the self-made couple. He doesn’t get their taste in music and they don’t get his music or really anything about him. If taking in cash-strapped strangers sounds far fetched, let’s remember that it was not that long ago that a third to one half of 19th century urban residents in this country either took in boarders or were boarders themselves. So is boom-mates really a thing? Is it really happening? Not so much. But it’s a safe bet that one of the sitcoms mentioned above is coming back to a TV in the common room where millennials and boomers can gather and share some laughs.